As a music nerd, I’ve always enjoyed end of year ‘best of’ lists. They are amusing, but are almost almost always ranked by what album is ‘better’ than another. Unsurprisingly, there is a lot of futzing about what ‘better’ means and pressure to rank something one way because that’s what the cool kids do. Although Last.FM will tell you what your most listened to albums in the last year are, it doesn’t exactly answer the question I have - what albums did I listen to the most that came out in the last year? Naturally, opening up one of these lists is a bit slow because the browser has lots of API calls to make to actually build the list. But hey, it met all the requirements I set up. For the end of 2012, I wanted to update the project, but with two different goals: make pages load FAST, and make it not so ugly. The result? http://albumsof2012.com (hosting / URL longevity not guaranteed). 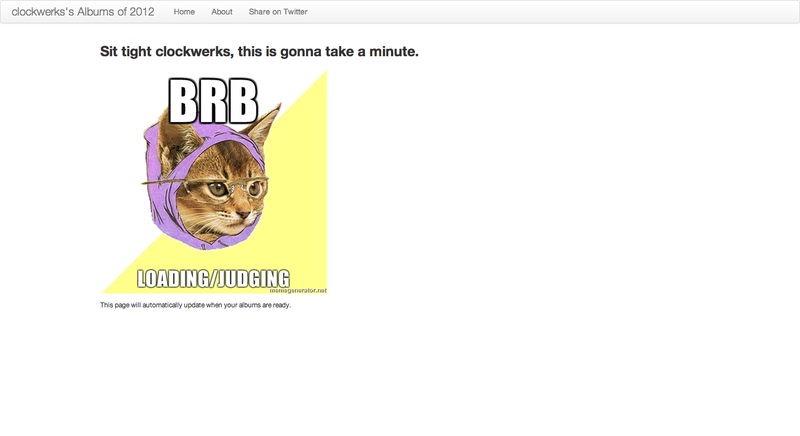 This time around, I opted to make to use Rails since it’s what I use at my day job. (Although we are few versions behind there, and I figured doing some work at HEAD would be educational). Most designers/developers will immediately notice that I used Twitter’s excellent Bootstrap framework to make the front end look nice. I heavily leaned on album art to make things pretty, which I think worked out well. 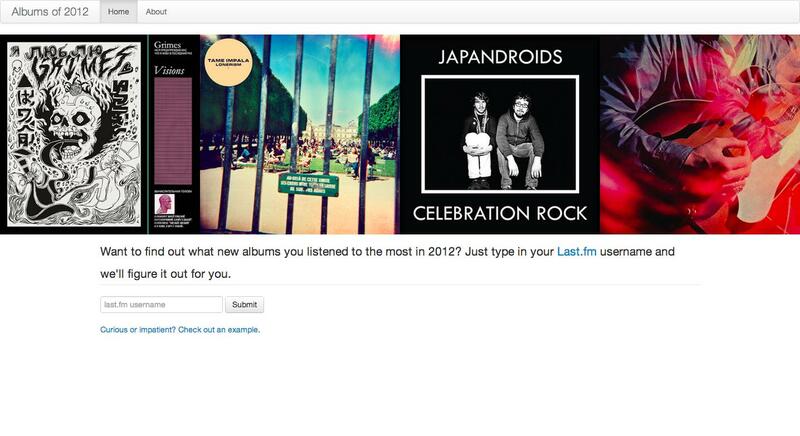 When a user tries to hit their list page (with a url like http://albumsof2012.com/lastfm/clifff), Rails checks Redis to see if the necessary API calls to build out their page have been cached. At first, the answer is no, so a ‘waiting’ page is immediately rendered, and a Resque job to fetch all the needed data is queued. This Resque job will pull a few pages of the most listened to albums by that user in the last month, and then for every album in that list, album info is fetched to see what it’s release date was. Last.fm often has incorrect data on this, so the MusicBrainz API is checked as a fall back. All of these calls are cached into Redis, and after all of them have been made, their username is added to the list. Meanwhile, the waiting page has been polling to see if their data is ready yet - and once their name is in the list, the page reloads, and their albums appear. My page of albums from 2012. It actually scrolls down quiet a bit. I posted the site to Twitter, Facebook and Reddit on January 8, and got moderate traffic throughout the day - about 1500 uniques when all was said and done. 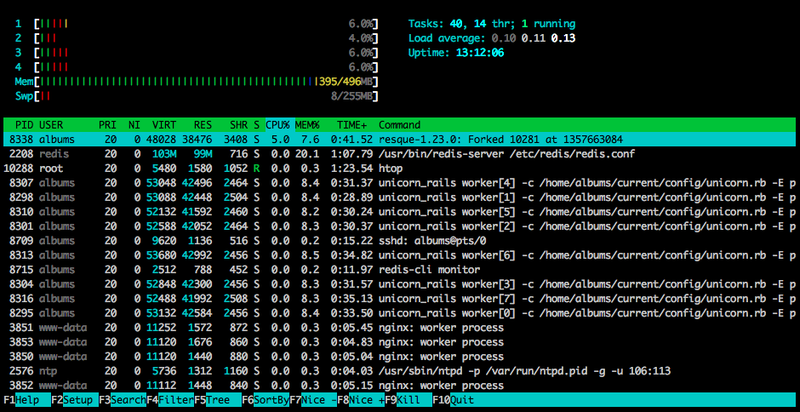 I was just running the site off the lowest tier Linode VPS, so I was a bit worried all day about the server keeping up - particularly, about Redis running out memory. In theory, as more users went to the site, more API calls would already be cached and the memory usage wouldn’t grow as fast. Not sure that really worked out though. Fortunately, I never quiet ran out of space, so didn’t have to figure out a scheme to fix this. Regardless, I still think Redis was a good choice because it made development/deployment fast. How fast? Almost all list requests were process within 100ms. Mission accomplished! As always, the source for this project is up on Github. 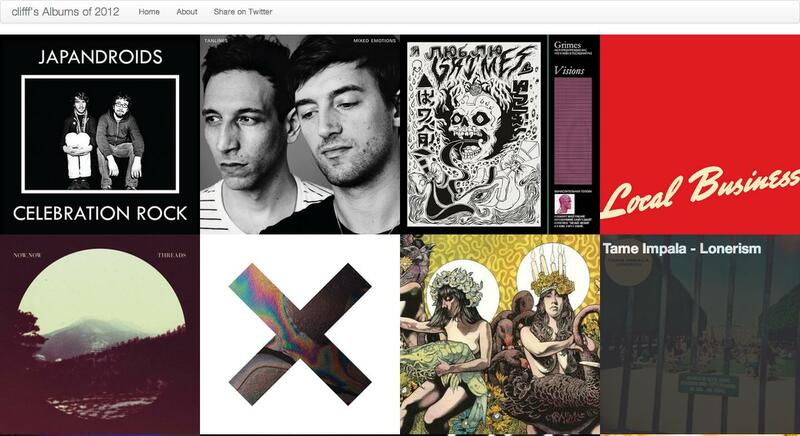 In the future, I would like to do more work to make my Last.FM history more browseable/digestable. Perhaps for Albums of 2013?